After two completely full days and nights, Sunday felt like a nice break. I had a relaxing morning, and got to know the chef (Albert) a little bit at the B&B where I stayed (I found a really cool and reasonably priced one on Capitol Hill called the 11th Avenue Inn.) Turns out Albert and his wife decided to move to Seattle just ’cause…they found a tiny apartment in the neighborhood and they both work part time. Basically the plan was to give up a bunch of stuff they didn’t need in exchange for a more low-key lifestyle. I love it when people make a conscious decision to break free from the preordained American rat race. For lunch, I met fellow writers Dave O’Leary (author of two fine semi-autobiographical novels: Horse Bite and The Music Book. You can find them both on Amazon) and Clint Brownlee. Dave also occasionally plays bass in a band called Sightseer. We met at Elysian brewpub down on 1st Avenue and were soon joined by yet another writer and historian: Jeff Stevens. We chatted about the usual musical stuff and then the conversation ventured into Seattle’s obscenely horrible transportation problem. Like many younger cities, Seattle grew too quickly and the lack of importance placed on public transportation has contributed to brutal highway congestion. I notice it gets worse each time I come here. 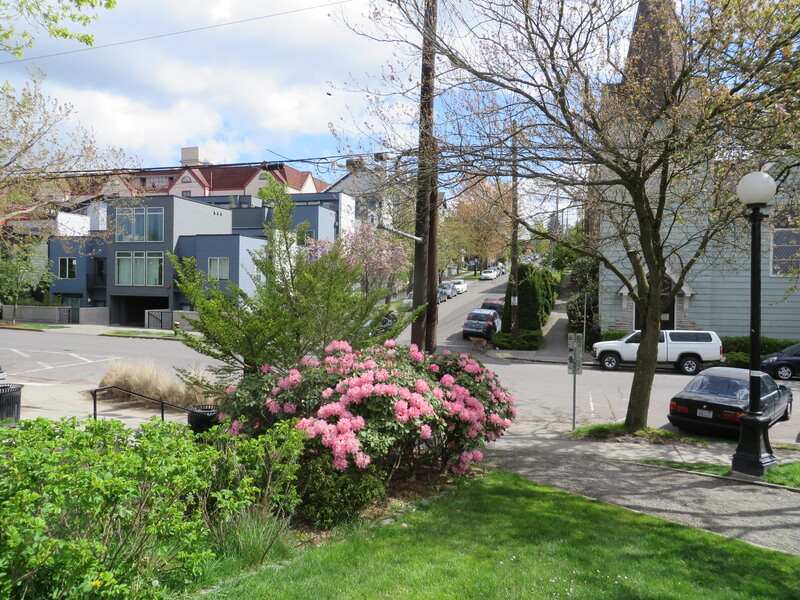 Apparently, Seattle’s solution was to build a tunnel…which of course makes little sense. To make matters worse, the boring machine got stuck against a lead pipe (I think…correct me if I’m wrong, Jeff) and still remains in the ground until officials can figure out what to do with it. On a fun note, we talked about Clint’s appearance in the Mudhoney video, “I Like it Small.” You can definitely make out his distinctive beard and Dodgers cap. See https://www.youtube.com/watch?v=7511NXJNV8o. Later, I headed over to Fremont to meet Jack Endino and his girlfriend for dinner (for Thai…something different! Forgive my wiseassery, Jack.) We talked about the usual music stuff…although Jack did mention something about an upcoming U-Men release. I, um, yeah…can’t wait for that one. Saturday would finish on a high note, with a trip up to Kingston to watch Before Cars play…the previous night I hung out with them at the Malfunkshun show. I headed up to Edmonds (Rob Morgan’s hometown [yay]) to catch the ferry over (it’s fun taking the ferry…try it sometime), and met the BC people at a bar called the Filling Station. 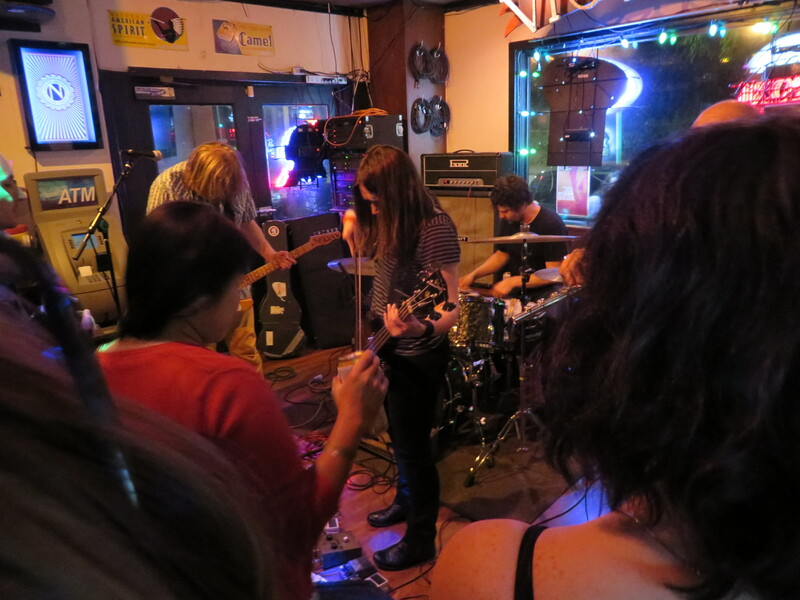 Before Cars is Chad Channing on guitar/bass, Paul Burback, also on guitar, Justine Jeanotte on violin and keyboards, and Andy Miller on percussion. What is their music like? Hmmm…I think Chad describes Before Cars as “alternative folk.” I would say they’re folky, but they also draw from the ’70s singer-songwriter genre as well. Justine’s presence also adds to the band’s musical palette as well as the overall talent level. I think their music fits the West Coast vibe well. 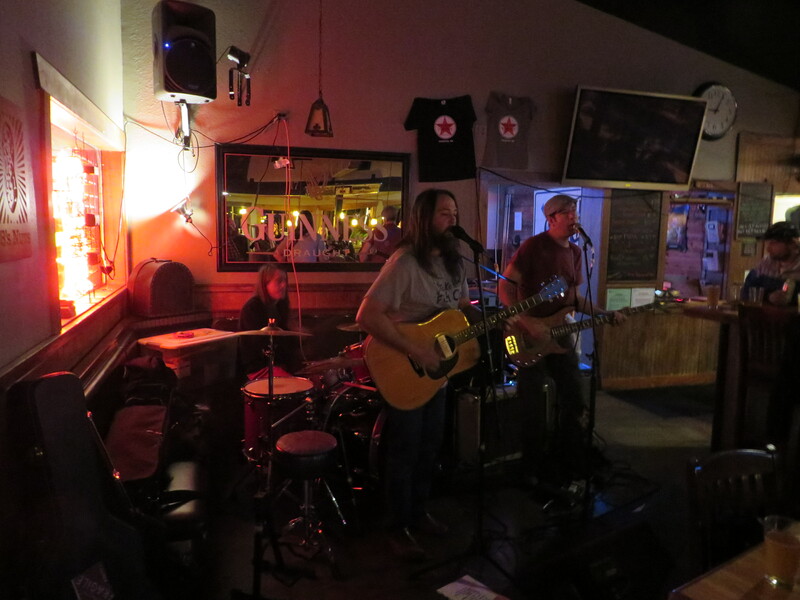 After some food and beers, BC friend Derek Burns played, with Chad on drums and Paul on bass. I took some photos and enjoyed what I hoped would be a long evening. Once again, however, there was a problem…you guess it–cats were involved. Paul and Justine had offered to have me stay over so I didn’t have to worry about the ferry schedule. They of course have cats, so…I would have to catch the 11:05 back to Edmonds. Before Cars offered up mostly new material, throwing in “Catch You When You Fall” from 2013’s excellent How We Run. (BeforeCars.com) I found their set perfectly matched my mood…it was relaxing and allowed me to savor the moment. Again, it’s a pretty cool thing to experience one of your favorite bands from a few feet away. At about 11, I said my good-byes and took off for the last boat back to Edmonds. I was asleep by midnight…an early bedtime for this trip. I’m doing this post in two parts, because too much stuff happened on Saturday. Meanwhile, back at the 5-Point… Leighton introduced me, or actually re-introduced me to Five. He plays bass, I think, in one of Leighton’s improvisational musical collectives. 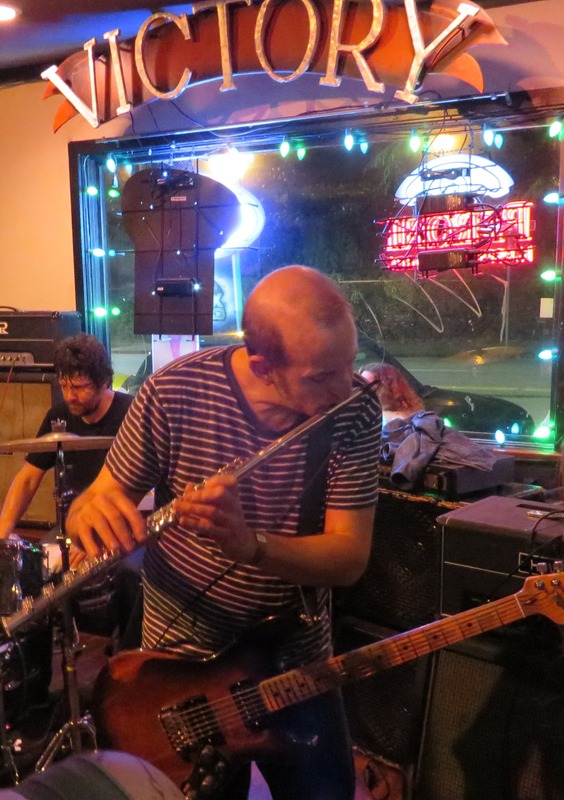 In fact, I did see him play a few years back in Belltown, and yeah, they were great…45 minutes of improvised deafening noise, but crafted (is that the right word?) beautifully. Five and I chatted and I immediately entered him into my phone contact list for a couple of reasons. One, he’s a cool guy and two, I now have a person named Five in my contact list. Oh, before I forget, while members of our party were still filtering in, the waitress asked if more people were coming because otherwise she might have to move us to another table. I counted up and said, “We have Five…literally.” After a typically awesome experience with Leighton and friends, I was excited to get Cat Day rolling. See, I’m highly allergic to cats…like they literally make me sick. Dogs, no problem, but I can’t be in someone’s house who has cats for more than a few minutes. And, apparently, everyone in Seattle owns cats…and I did not know this. It only took 13 trips here to figure that one out. 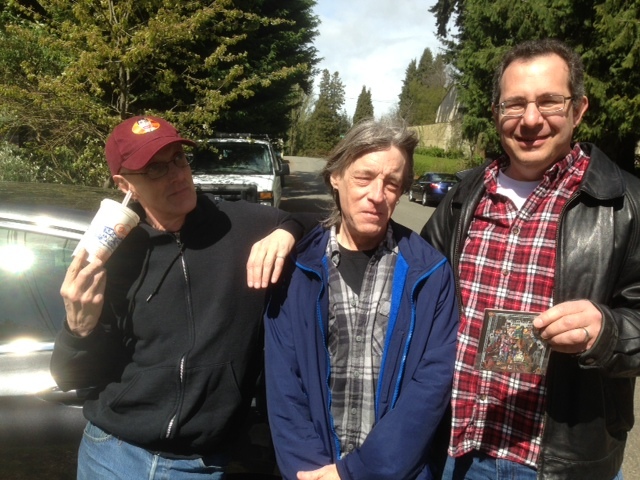 So post-Leighton, I made my pilgrimage to Rob Morgan’s house…Rob is one of Seattle’s original punk rockers. He’s an artist, a musician, and well…he’s Rob. 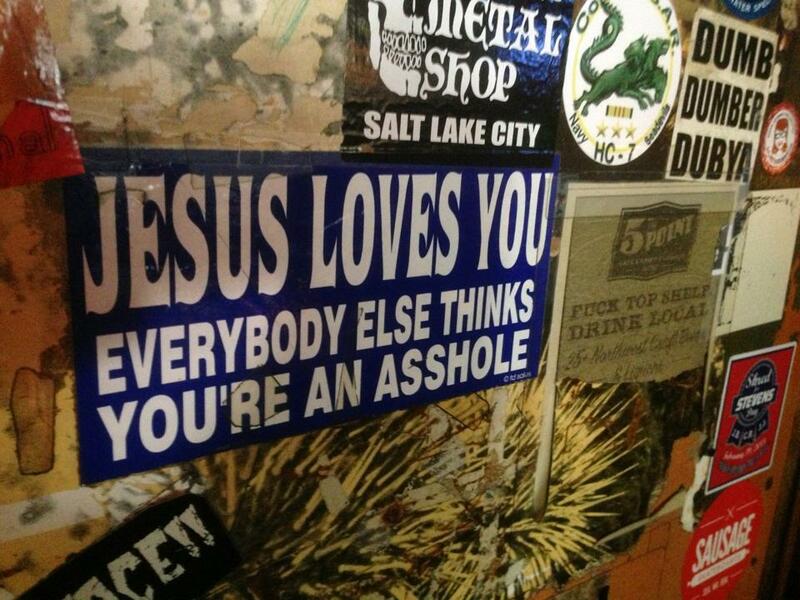 That’s all I can say, and I love him. 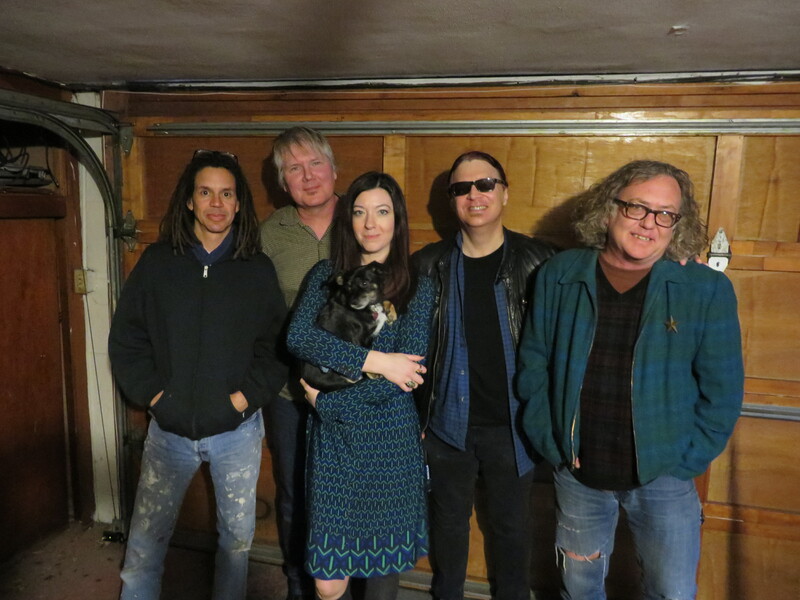 Since Rob has cats (of course), we headed out and drove around Ballard, while we listened to his friend and former Squirrel Kevin Crosby’s new record, Money What Money? Rob’s on it, as well as Baby Cheevers (Google him or read my book…Cheevers is a legend.) Rob and Kevin described the record (at least I think they described it this way) as a parody of Frank Zappa doing a parody of Sergeant Pepper’s, sprinkled with some obscure Squirrels references. The record is, well it’s great, and fucked up, and ridiculously creative. At one point during the recording, Kevin said the producer would not approve of him using a duck squeak. So he found another producer. Afterward, I headed back to Capitol Hill to re-interview Vaporland. I say re-interview, because I talked to those folks a few months back by phone from Philly. We began that chat at midnight (9 pm Pacific), and I think we talked for about an hour. Great interview…lots of funny and insightful banter. And then after I was done, I couldn’t find the mp3 file. I’ve done hundreds of interviews, and I’ve never lost a recording. But this time I did. It sucked. Fortunately, the Vaporland folks were more than cool about it…as Seattle people tend to be, and we informally talked about doing it again live, the next time I headed to Seattle. And so we did. Oh yeah, Ron has cats, so we did the interview in his garage. He brought out some chairs and a portable heater and Katie served us some coffee and then things got rolling. I would say it went better than the original phone chat…lots of great stories, insight into song writing and influences, and of course that Seattle humor. Please, though, don’t tell me everything happens for a reason. That expression can make me violent. I woke up at 6:30 when I had the opportunity to sleep in (of course.) The only thing planned in stone was the Malfunkshun show that evening. I was hoping, though, that I might have a chance to meet up with Sub Pop founder Bruce Pavitt on this trip. I interviewed Bruce about his two books and he was kind enough to Skype with my students a couple years back when I did an honors course based around my book (ooohh…here’s a course about me, aren’t I great!) So I texted him around 9 and we agreed to meet for coffee. We chatted about a number of topics including the future of music. And then, for some reason, I mentioned how Nirvana’s Dive intrigued me…in the way Kurt threw in this weird G chord which disrupts a clean progression going up the fret board. It makes the song. Bruce said Dive is one of his favorite Nirvana songs, as it just captures the essence of that band and Kurt. Later, I met up with the Before Cars people (more on those folks coming up in the Day 3 post) on Bainbridge Island. 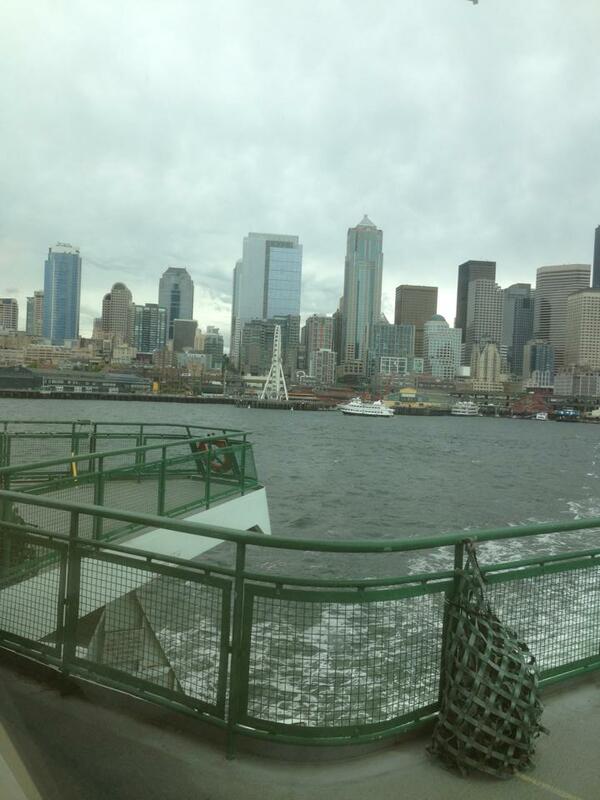 By the way, it’s always fun to take the ferry over to Bainbridge from Seattle. If you haven’t had the experience, go for it. You get a 30 minute ride with a chance to check out Seattle’s beautiful skyline. Plus, Bainbridge is a cool place to explore. We had a bite to eat and a couple beers before making our way up to the Point Casino to see Malfunkshun. Experiencing a one-time subversive grungy band in a casino somehow doesn’t seem right…but the tacky beach motif (including sand) made it so over the top that it seemed to work. Mos Generator opened. I’m not familiar with their music, but apparently they’re heavily influenced by Black Sabbath. Paul Burback from Before Cars told me their drummer quit like the day before or that morning, so the remaining two players decided to do an acoustic set. 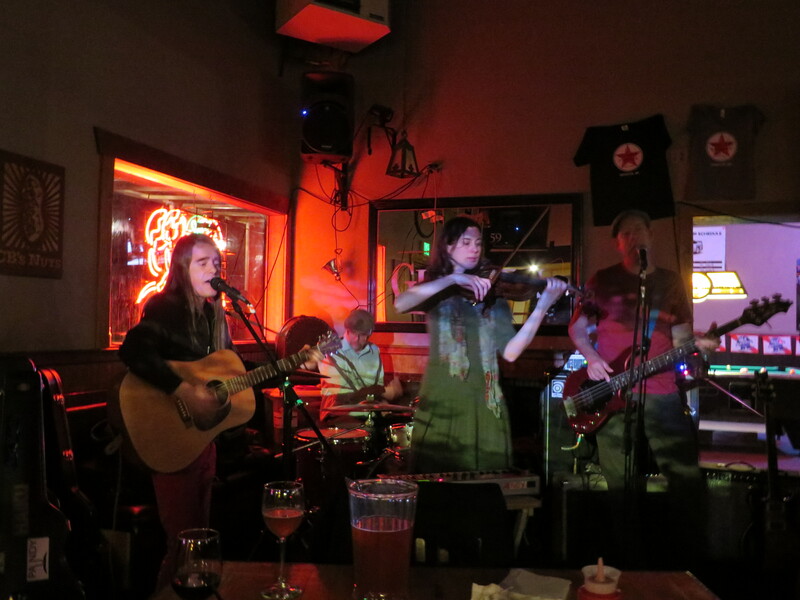 All I can say is they were fantastic…really bluesy and the guitar player (Tony Reed) also has a great voice. I chatted with Tony afterward and bought a CD and a shirt. Malfunkshun took the stage next. I sat toward the back with the Before Cars folks, including multi-instrumentalist Chad Channing. The highlight, for me, was the last song (With Yo Heart and Not Yo Hands…off the original Deep Six record.) 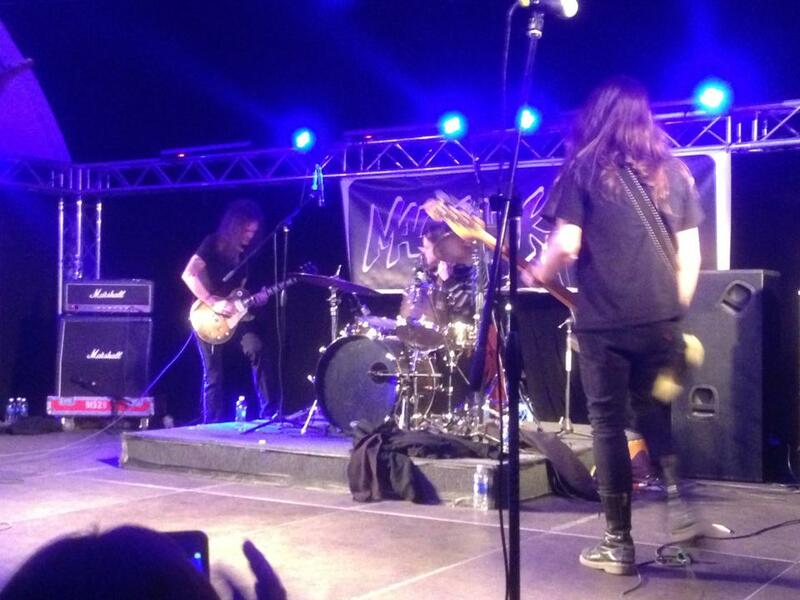 Malfunkshun’s Kevin Wood called out and requested Chad to come up and play drums…which he did. We all stood around and bantered back and forth a bit before they whisked me off to catch the last ferry…which was supposed to leave at 12:55 am. 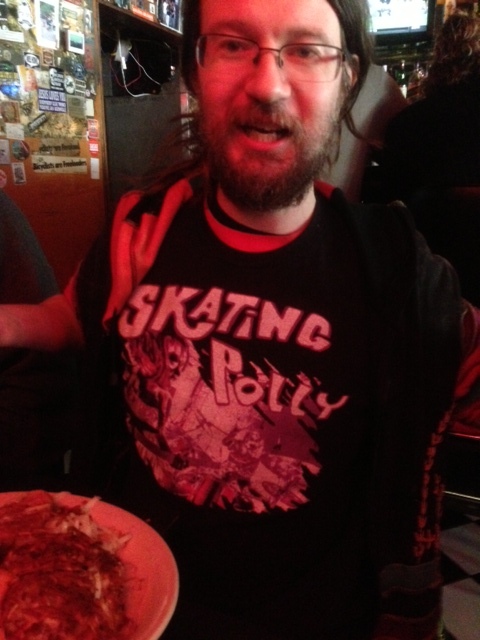 It didn’t depart until nearly 1:30 am, however, and I had breakfast plans at 9 with the Thrown Ups’ Leighton Beezer. I could not miss that for anything, so I resigned myself to another brief night of sleep. Coming Up: Day 3, otherwise known as Cat Day. Finally made it back to Seattle after a two-year hiatus. This trip, so far, has been an absolute whirlwind…fortunately, today is a kick-back chill kind of day, so I thought I’d take a few minutes to reflect. The day began at 8 am East Coast time for me, where I did a phone interview with a member of the Pentangle who resides in London. After discussing Richard Nixon with my two classes, I drove to the airport and flew to Seattle. I did the obligatory stop off at the Sub Pop shop at SEA-TAC airport and checked into a B&B on Capitol Hill. 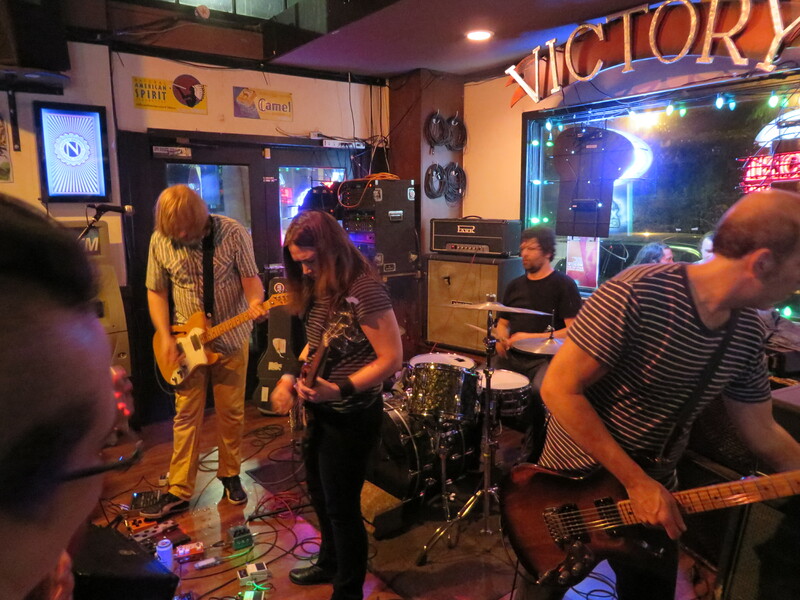 I then headed down, on foot, to a tiny bar on Eastlake called the Victory Lounge. I had discovered that Kinski, my latest Seattle band crush, was playing there. After a few songs by an opening act, Kinski took the stage and proceeded to blow the roof off the place (well, not literally, it’s a clichéd rock writer expression.) It’s pretty cool to watch one of your favorite bands play from five feet away (and, yeah, earplugs are a necessity.) I don’t know how to describe these folks, but picture going to a Black Sabbath concert, and then finding out they play in odd time signatures and alternate tunings. In other words, if Black Sabbath and Sonic Youth had a baby, it might be Kinski. Oh, and one of the guitarists also plays flute and the bass player occasionally uses a bow. And they completely rock out. After the last song, I turned to a stranger next to me, and told him just how flat out great this band is. He agreed, and I noticed he spoke with an English accent. Turns out he is from London. So, in a way, my day began and ended in London. 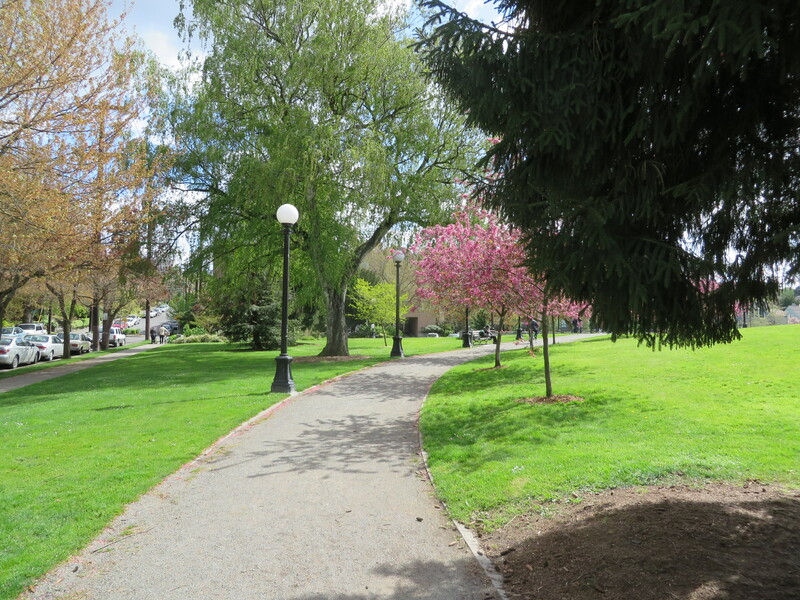 After Kinski finished up, I headed back to my room…and if you don’t know anything about Seattle, Capitol Hill sits on a hill (hence the name, duh) and well…let’s just say the walk back was a good workout. My head hit the pillow at 1:30 am PT, or 4:30 ET. So after a 22 hour day, I drifted off to sleep to rest up for a full day on Friday.